Our Big Bend channel markers provide good cover for predators. Proof comes in the springtime when visitors to our coastline question the appearance of boats circling almost every marker alongside the Barge Canal south of Yankeetown and either of the major channels at Cedar Key. Spring is “cobia time” and lots of anglers are on the lookout for ling, crab-eaters, or lemon fish–as they’re called by many old-timers. But finding these hard fighters usually isn’t as hard as getting them to eat or getting them to the boat. 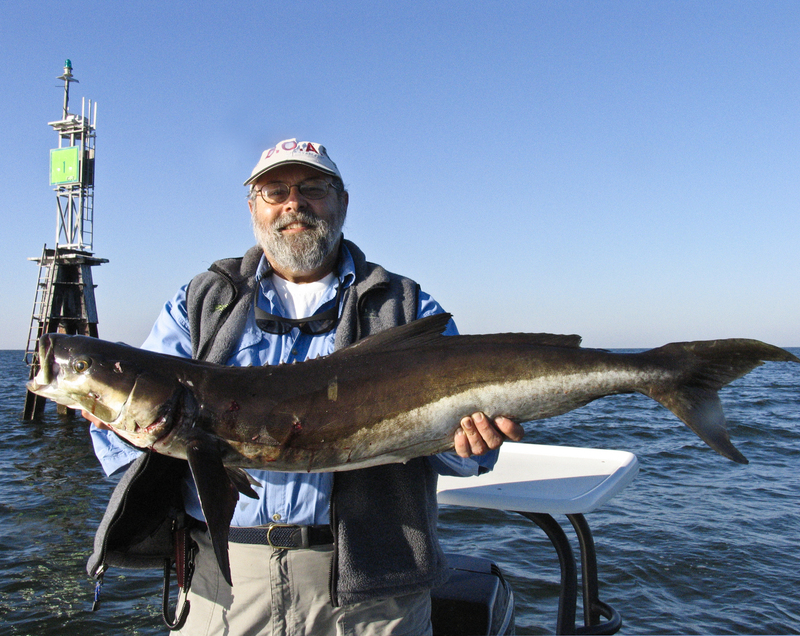 Successful cobia hunters make a point of idling around every channel marker they encounter. Big tripod-style markers are few and far between, but often hold more cobia than single markers. If you’re on your way offshore and don’t have time to stop at every channel marker, be sure not to miss the tripods. On bright days, and if the water’s clear, you’ll likely see cobia hanging close to the marker on slack or slow-running tides. If the water’s moving quickly, expect them to hang back away from the turbulence caused by the structure. In any case, their “game” is to ambush small baits like pinfish, white bait, eels or crabs that pass. And don’t worry about noise. Keep your motor running, as cobia are curious and will often come boatside just to see what’s going on. As I said, finding cobia is sometime the easy part of your trip. Getting these picky eaters to take a bait can be frustrating. If I spot one, I anchor up (or use the Spot Lock feature on my Minn Kota iPilot), positioning the boat where I can cast my bait towards the marker. I recommend leaving your outboard running and out of gear, as you’ll sometimes need to pull a big fish away from the structure once it’s hooked up. Cobia are notorious for wrapping line around markers. Crabs and live pinfish make excellent bait for cobia, however eels are like candy to them. If you can find live eels, take them with you; otherwise Gulp! and Hogy make excellent plastic imitations. Often, if the water’s dirty or dark, you’ll need to fish a marker where cobia don’t show themselves. In those cases, and if you’re lucky enough to have a crew (two to fish and one to captain the boat), float one bait under a cork and put another on the bottom using a slip-sinker rig. Landing a cobia can be an ordeal. First, use appropriate tackle. Big spinning outfits, spooled with 30 to 50-pound braided line and almost-invisible 80-pound fluorocarbon leaders will give you a chance against a big fish. Second, when a cobia strikes, get any other lines back to the boat and clear the decks. Fighting one fish at a time is about all any boat crew can handle. And finally, NEVER bring a “green” cobia into the boat. They’ve been known to break rods, gaffs, and even anglers’ arms. Get them covered by a towel, or better yet, into a cooler and locked down as soon as possible. Fishing for cobia can be exhausting, in the hunt and in the fight, but if you bring home a keeper, expect some of the best eating of the spring. Prepare some cobia steaks by broiling, grilling or smoking and you’ll certainly keep your crew happy.